Beautiful location. Pool is a plus. New addition to home was beautiful. Main house needs to be updated with furnishings. Sofas and mattresses were uncomfortable. Rust or iron is in water. Several white clothing was ruined in washer due to staining. Large kitchen window did not lock which left us uneasy in a unfamiliar neighborhood especially when we found a chair outside under the window. Overall, we had a nice time. Check in & out was easy. A few cobwebs. Perfect vacation for our young family! We will definitely rent it again. Would buy it in a heart beat! Great location! Love the town and the residents! This is my 5th stay at Clearview that speaks for itself. My full time home is located on the Ocean front of the New York Harbor but I enjoy the Chesapeake Bay getaway and the peaceful serenity at Clearview. The house had some lovely upgrades this year always with the warmth of a bay cottage. Eastern Shore Vacations bend over backwards to accommodate their guests. I highly recommend ESV to home owners looking to rent or guests looking for a memorable vacation stay on the Eastern Shore. Thank you for everything. The property and setting was beautiful. Nicely decorated and very relaxing. A few more cobwebs (inside and out), that we would have liked, and a blender that didn't work. Requested a new one, and it took over 2 days to arrive. After we vacuumed and cleaned the front and rear porch, we felt more at home. Other than that, loved everything. Found some great restaurants on Tilghman and St. Michaels. Great weather, too. We stayed at Clearview a few years ago for 4 nights and decided to go back for a week long stay this time around. Overall, our stay was pleasant and very enjoyable for the family. The Pros: affordable relative to other houses on the Eastern Shore; very clean; nice pool and hottub; pet friendly, and good water access. Cons: Tilghman is a bit out of the way (20 minutes to St. Michaels); crabbing was a bust due to the location on the bay; water was a bit rough for novice kayakers; and not a lot to do on the Island. Overall, I would say a good destination for a 3-4 night stay for the average family. A week-long stay was a bit much for us, but if that's what you're lookign for, it's a very good value. It was a very relaxing enjoyable vacation. We couldn't ask for too much more. It was our first stay on Tilghman Island and we loved it. We had a wonderful time at this vacation home. 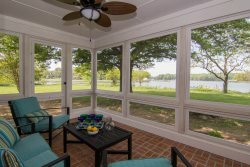 The setting as well as the layout of the house are perfect: on the Bay, beautiful views, spacious, cozy and comfortable sitting areas, large enough kitchen with everything you need in it, fishing pier and beautiful pool ! The atmoshere on TI is laid back and there are a few excellent restaurants just 5 minutes away. And then there is St Michaels for those who want to do some browsing in the nice little shops there. If there is ANYthing I would add to the house it would be a screened in porch so that you can enjoy the beautiful starry skies without being bit by those pesky mosquitos. Overall we loved the island and the house and can highly recommend it ! If you're looking for a peaceful, local vacation look no further. Good location, layout, and amenities. This was such an easy vacation rental! Eastern Shore Vacation Rentals did everything to make it easy to arrive and depart. My only regret: we couldn't use the pool! Sunsets were spectacular. We had a lovely short stay at Clearview, enjoying the view from the dock, the cozy pool, and the tucked away location. The house was quite well-stocked and we brought too much as usual. We'll have to try kayaking next time - too lazy this time! Very enjoyable week. Responsive staff - would definitely go back if we decide on an another Eastern Shore vacation. Would be perfect if the lift were operable. The property and the view were beautiful. The pool was great. House was exactly as described and roomy for everyone to have a great time. Since the weather was in the 100's the pool came in very handy. Clearview was wonderful: views were beautiful, the pool was perfectly maintained, the house was clean & maintained - as the pictures show. Overall an awesome stay. We had a great quiet time. Incredible sunsets. Best stocked house ever. Fireplace is very tempermental!! Love the location. Eastern Shore Vacations is very accommodating and attentive to any need that may arise. They were again, a pleasure to work with for the 3rd year in a row. We and our two dogs absolutely loved our stay. We never felt "cooped up" even though it rained almost every day, almost all day long. We maximized the snippets of sun around the pool, with the dogs relaxing by our sides. We wish we had thought to bring a net for crabbing off the dock. Our Invisible Fence collars worked at this property, much to our surprise. We brought them to psych the dogs into thinking they couldn't go beyond the area we had flagged. Most amazing of all were the nesting bald eagles two houses away. Magnificent! This was a very nicely maintained house (though the pool was a bit dirty upon arrival, which did get cleaned during the week) with a very cozy feeling. The house is right on the Chesapeake so fishing was excellent (bluefish mostly), while crabbing was not so good. Also, if you're a novice and planned on kayaking, this may not be the best property as the water tended to be a bit rough. My least favorite feature of the property, and a personal preference, was the distance this house was from the 'mainland'. Tilghman Island is about a 20 minute ride into St. Michaels. That's ok the first time around, but doing this daily for 5 days became a bit old after a while. Also, Overall, nice house, nice pool, some good fishing, but wish it wasn't on Tilghman Island.